Are You Feeling Tired and Looking Tired? Are you experiencing weight gain and skin disorders? One of the first signs of aging are eye bags and sagging skin, your skin is your health! 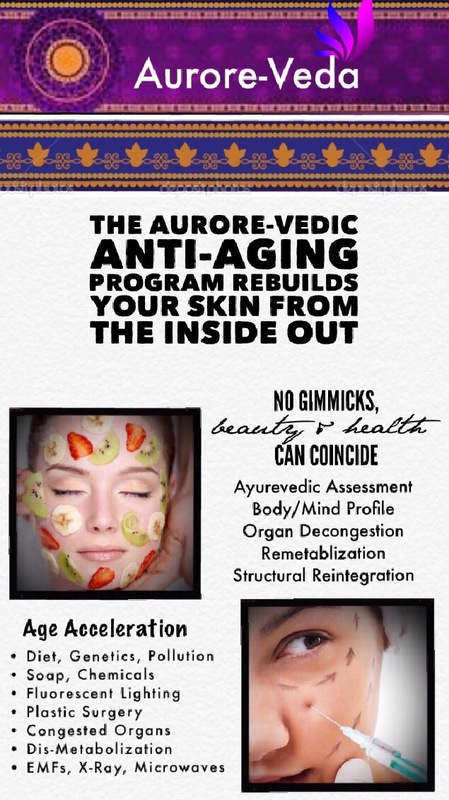 Anti-Aging & Acne Programs-that really Work… from the INSIDE OUT! DELAY or SUBSTITUTE botox and surgery-look and feel AMAZING! Decongest the Organs & Stimulates Metabolism! Take the FREE Assessment and get started today! LOOK 10 Years Younger, FEEL IT! Dr. Aurore is not only licensed in skin care, she is an ayurvedic doctor of natural health and the author of 6 books. She has been a subject expert providing numerous lectures and news interviews. Your private consultation is valuable because she will evaluate you and give you an ayurvedic assessment. She will evaluate specific organ toxin congestion from stress and our modern lifestyles. Next, she will develop a customized organ decongestion and metabolic activation program just for you.